Vinesh Phogat assured herself and India of at least a silver medal at the Asian Wrestling Championship as the Commonwealth Games gold medallist entered the final of the 50kg category with win over Japan's Yuki Irie. Vinesh Phogat assured herself and India of at least a silver medal at the Asian Wrestling Championship as the Commonwealth Games gold medallist entered the final of the 50kg category with win over Japan's Yuki Irie. The 2014 CWG champion earned the win by taking a bigger point as she locked the score 4-4 with her move. The Asian Games bronze medal winner will now fight out with China's Chun Lei for the gold medal. Another Indian woman wrestler, who is in medal contention is Sangeeta, who will fight for a bronze with Korea's Jieun UM in the 59kg category. Sangeeta had lost her quarter-final 5-15 to Uzbekistan's Nabira Esenbaeva. Lalita though had no luck going her way as she was outplayed 0-5 in the 55kg quarterfinal against Mongolia's Davaachimeg Eekhembayar. 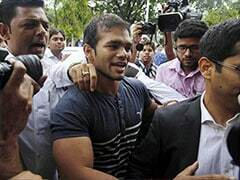 Meanwhile, India's two Greco-Roman wrestlers have already won bronze medals. Harpreet Singh grabbed bronze in the 82kg when he outclassed Uzbekistan's Khashimbekov 11-3, winning on technical superiority. 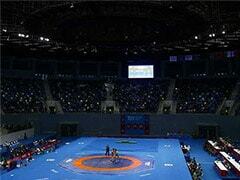 Rajendra Kumar had won bronze in the 55kg as he beat Uzbekistan's Mirakhmedov after declared winner. He also got victory by points after levelling the score 3-3. 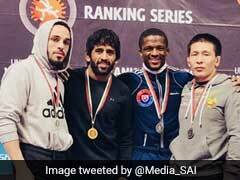 To miss out on a bronze medal was Kuldeep Malik (72kg), who lost the bronze medal bout 0-11 to Japan's Inoue Tomohiro and Manishm who was edged 4-6 by Uzbekistan's Rakhmatov Mirzobek. Naveen, competing in the 130kg, lost his bronze medal round 1-3 to China's Xiaoming Nie. Naveen had reached the medal round after winning his repechage round 10-0 against Sonoda Arata from Japan. Others who were ousted at earlier stages were Vikram Krushnath(63kg), Sunil Kumar (87kg) , Hardeep Singh (97kg).